The 2018 Hyundai Tucson shows that a practical family SUV can be beautiful. The exterior of the new Tucson is enhanced by details like standard front solar glass and rear privacy glass. A panoramic sunroof is optional, as are stylish 19-inch wheels. The interior of the 2018 Tucson is practical and attractive, with standard YES Essentials® stain and odor-resistant cloth seating. Heated front seats are optional for optimal occupant comfort. Check out the new Tucson by taking a test drive at Humble Hyundai today. The 2018 Hyundai Tucson is dedicated to protecting its occupants in every way possible. Hyundai's top engineers designed a variety of cutting-edge safety features to help you avoid accidents. The safety features offered by Hyundai include Automatic Emergency Braking with Pedestrian Detection, Blind Spot Detection with Rear Cross-traffic Alert and Lane Departure Warning. Competitors like the Ford Escape, Nissan Rogue and Toyota RAV4 can't match the package of safety features in the new Tucson. Experience the true meaning of automotive safety by test-driving the 2018 Tucson at Humble Hyundai today. The 2018 Hyundai Tucson offers an excellent selection of efficient and sporty engines. The standard engine is a 2.0L 4-cylinder kicking out 164 horsepower. A 1.6L diesel engine, making 175 horsepower and delivering an EPA-estimated 30 MPG highway, is optional. You can also choose an available 2.4L 4-cylinder that produces 181 horsepower and gets an EPA-estimated 28 MPG highway. Take the 2018 Tucson out for a spin at Humble Hyundai today. The 2018 Hyundai Tucson is chock-full of unique technology that is designed to enhance the driving experience. Possibly the most unique piece of tech in the new Tucson is the standard Clari-Fi™ Music Restoration Technology, which restores the clarity to digital music that can be lost during the production process. Unlike competitors like the Mazda CX-5 and Toyota RAV4, the 2018 Tucson has Apple CarPlay™ and Android Auto™. 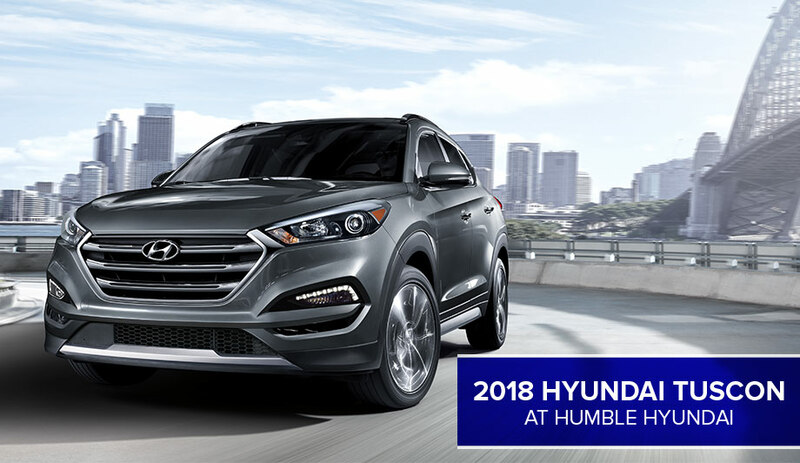 If you're in Houston, Humble or Atascocita, TX try out the new technology in the 2018 Hyundai Tucson with a test drive at Humble Hyundai today!